On the surface, Louis K. Lowy’s To Dream: Anatomy of a Humachine I is a troubling tale of a future where corporations rule whole worlds and life is as cheap as dirt. However, hidden beneath the grime is a touching story that explores the transcendence of love between a mother and son and what it means to be alive. To Dream follows its main characters back and forth across time. In 2030, Niyati Bopari, a scientist working for Ameri-Inc. deep within the Florida Everglades, is struggling with the loss of her son, Jay who died in a tragic car accident years earlier. In his image Niyati has created the most advanced robot in human history, a humachine named J-1, which is hailed as a revolutionary accomplishment, but no one knows Niyati has infused J-1 with her son’s DNA. When sent by Ameri-Inc. to pick up the machine, a rogue agent decides to take J-1 for himself, setting up Niyati to appear to have conspired in the theft. Niyati finds herself on the run from a corporation hell-bent on retrieving their asset. Still early in the novel, in the year 2250, J-1 is responsible for receiving and transport in a warehouse on the distant planet of Truatta. During an attack on the warehouse by an uncanny group of native rebels, J-1 comes across a strange liquid spilling out of a mangled crate. Out of curiosity—which robots are not supposed to have—J-1 inspects the wreckage and even tastes the liquid, causing him to malfunction. Upon wakening, J-1 finds himself in the company of Truatta natives who are leading a rebellion against his corporation. He learns that everything he thought he knew about Ameri-Inc. was a lie. But J-1 has a bigger problem to deal with—he is beginning to feel. Memories that are not his fill his mind, and, though he knows that he is a machine and shouldn’t be experiencing emotions, he has little power to stop it. He is becoming human. “Rough go, eh friend?” Teague quietly said to him after things had again settled down. J-1 took a heavy breath and slumped against Coco. Another strong focus in To Dream is the politics of Ameri-Inc. The corporation is run by Rebeka Takats, a power-driven tycoon who has no problem driving her adversaries into the ground as long as she profits from it. And by adversaries I mean every living person in the universe, including her fellow shareholders, family or not. The wide expanse was a surprisingly pretty blue, not the nutmeg color he usually associated with Everglades’ water. Portions of it were covered in green lily pad clumps and others in clusters of tall, brown, razor-sharp sawgrass. The bass boat that J-1 had used to carry them here lay face down, half in the muck and half in the water. It had a hole the size of a bowling ball in the bottom and a long tear along the back and side of the hull. It was obvious that it would no longer float. Acevedo shoved it in the water and watched it sink. While it may seem that Lowy has a lot to deal with handling the many overlapping threads of the novel, he does an exceptional job jumping between timelines as well as points of view and keeps his chapters short to ensure a fast pace. To Dream is an action-packed thriller that rarely lets up. The characters are natural and robust. This is not just a story about a robot coming to life—it’s an exploration of the darkness that surrounds him, and the light that brightens his past. Daniel Santos is a recent graduate of Florida International University. He lives in Dania Beach, FL, where he reads and writes pretty cool things. Neil Gaiman is widely known in the world of fantasy for dark and lighthearted works like Caroline, The Graveyard Book, American Gods, Neverwhere, and Stardust. He has won awards including the Hugo and Nebula. 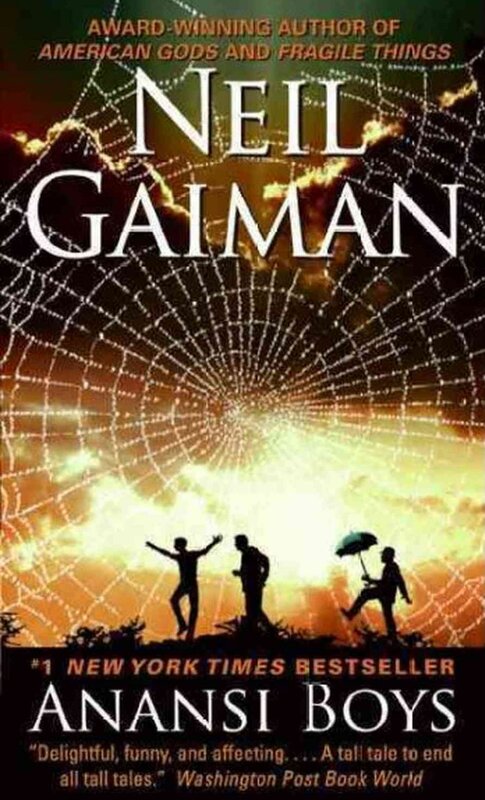 Gaiman’s #1 New York Times Bestseller Anansi Boys, a fantasy novel largely set in Florida, was released in 2005, before the founding of The Florida Book Review, and this reconsideration is being written because of FBR’s interest in the role of Florida in fantasy fiction. Despite its setting, this novel is not unlike Gaiman’s other works. While it has a dark flavor, it is extremely humorous. There were times when I had to put the book down because I was laughing so hard. This was not a good thing because I usually do most my reading at work, where I’m not supposed to be reading . . . or laughing. It was a highly enjoyable read and also a surprising one since this was the second time I’ve read the book and I still found it hilarious. Anansi Boys is technically a continuation of what some consider to be Gaiman’s most famous novel, American Gods. This does not mean that one has to go out and pick up a copy of American Gods before delving into Anansi Boys—although that's not a bad idea. Anansi Boys is more of a spin-off from its predecessor and stands on its own. Those who have read American Gods may remember Mr. Nancy, who plays the role of Anansi—the trickster god of stories. 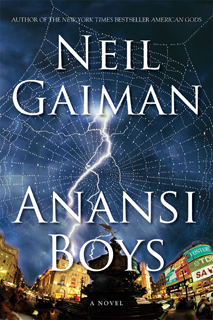 Anansi Boys is about how Anansi's children find each other and discover their role in the world as the sons of a god. The main character here is Fat Charlie Nancy. Things don’t always go too well for Fat Charlie in the novel, but they never did. Embarrassment and failure seem to follow him—they stick to him very much like his name. The thing is, Fat Charlie is not fat. Truth to tell, he was not really even chubby, simply slightly soft-looking around the edges. But the name Fat Charlie clung to him, like chewing gum to the sole of a tennis shoe. He would introduce himself as Charles or, in his early twenties, Chaz, or, in writing, as C. Nancy, but it was no use: the name would creep in, infiltrating the new part of his life just as cockroaches invade the cracks and the world behind the fridge in a new kitchen, and like it or not—and he didn’t—he would be Fat Charlie again. Throughout Fat Charlie’s youth, his father would make an art out of embarrassing him. At one point he even tricked Fat Charlie into going to school as one of the Presidents for President’s Day. Charlie went as John Quincy Adams only to become the laughingstock of the school. Even while dying, Fat Charlie’s father is embarrassing. While singing “I Am What I Am,” on stage at a small bar in Florida, Fat Charlie’s father has a heart attack. With his last ounce of strength he reaches for a well-endowed blonde woman and rips her shirt off, exposing her breasts. Even though Fat Charlie is thousands of miles away, in England, when this happens, he still feels compelled to apologize to everyone at the bar. Fat Charlie, however, hasn’t known his father was a god. He is told this during an argument with his old neighbor, Mrs. Higgler, when he flies into Florida for his father’s funeral. “No. Just a god.” She said it without any kind of emphasis, as flatly and as normally as she might have said “he was diabetic” or simply “he was black”. Despite his disbelief, when Fat Charlie comes across a picture in Mrs. Higgler’s house showing what he thinks to be himself standing by a mirror, she tells him that the picture is of him and his brother. He doesn’t believe her and thinks that what he’s looking at is only his reflection. However, she tells him that all he has to do to see his brother is tell a spider. He does this very thing soon after. It becomes one of the biggest mistakes Fat Charlie makes. Fat Charlie’s brother does indeed come. However, unlike Fat Charlie, his brother, Spider, inherited all the abilities of a trickster god and turns Fat Charlie’s life upside down. A lizard zapped up one of the struts of the metal fence at the edge of the memorial garden, then poised itself at the top of a spike, tasting the thick Florida air. The sun had gone behind a cloud, but, if anything, the afternoon was getting hotter. The lizard puffed its neck out into a bright orange balloon. Anyone who has ever lived in Florida knows that there is much more to the state than beaches and palm trees. The real Florida is found in its exotic wildlife, and its hot and humid sun. Gaiman knows this as well. On the cultural side of things, Traditional African Religions have played a great role in many of the belief systems shared by the Caribbean people and, subsequently, Floridians. Both Santeria and Voudou are practiced in Florida. The gods Gaiman includes in the novel are all of traditional African theological origin. He also tells tales of Anansi outwitting other gods throughout the text, creating his background while depicting parallels between Anansi and his children. Having studied traditional African religions as wells as Caribbean religions, I really appreciate Gaiman highlighting this aspect of Floridian culture. This novel will appeal to a lot of readers. Those who like slapstick comedies will love this story about an unwanted guest. And those interested in seeing a different, more realistic, side of Floridian culture and beliefs will find this book to be intriguing. Though it’s eleven years old, this book holds up, for reading or rereading. 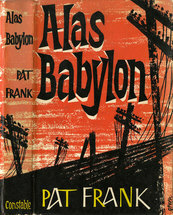 Pat Frank’s 1959 novel Alas, Babylon is one of an important group of novels released at the height of the Cold War that speculate about life in post-apocalyptic America. And it is one of the few major works of science fiction to be set in Florida . . . although, in this case, I mean “science fiction” in its broadest sense. Most readers today probably would classify it as an action or adventure story. Randy Bragg, in his early thirties, is an attorney with few clients who recently ran for small-time political office but lost and now drowns his sorrows in bourbon and a casual sexual relationship with Libby McGovern, the girl down the road. He lives off a small trust and the proceeds from the orchards surrounding his house in small town Central Florida. Outside the idyllic (to us now, perhaps then meant to be typical) town of Fort Repose, the Cold War rages, with the press announcing that some congressmen are calling for the U.S. to shoot down the recently launched Soviet Sputnik satellite. The political turns personal when Randy’s brother Mark, a military intelligence officer with Strategic Air Command, asks Randy to take care of his family, gives him a check for five-thousand dollars, and tells him to cash it right away and lay in essential supplies. A Soviet general has defected, and we know that nuclear war is imminent. In October the new crop of early oranges began to ripen. The juice tasted tart and refreshging after months without it. In October, the armadillos began to grow scarce in the Fort Repose area, but the Henry’s flock of chickens had increased and the sow again farrowed. Also, ducks arrived in enormous numbers from the North—more than Randy had ever seen. Wild turkeys, which before The Day had been hunted amost to extermination in Timucuan County, suddenly were common. Randy fashioned himself a turkey call, and shot one or two every week. Quail roamed the groves, fields and yards in great coveys. If all this sounds familiar, I am not surprised. Alas, Babylon reads like a contemporary thriller, not great literature but something you’d like to have with you on the airplane. There’s even a slick move where Frank cuts back and forth between the main story in Central Florida and the military chain of command at work in the Strategic Air Command bunker, a la Tom Clancy. In this way, the novel is ahead of its time. It also set the stage for modern Survivalist fiction, and we see many of its conceits continuing in works like AMC’s television show The Walking Dead. In other respects, Alas, Babylon is terribly dated. While Frank’s portrayals of race and gender roles may have been moderately progressive for 1959, I found them uncomfortable, not so much for the content but for the way they gloss over dilemmas of race and gender in society. Fort Repose itself is a time capsule of a bygone Florida (or America, for that matter) and is sometimes portrayed with sentimentality. Without giving too much away, by the end of the book I was reminded as much of 1899 Florida as of 1959 Florida. I suspect that at the time of Alas, Babylon’s publication, Fort Repose may already have been something of an anachronism, a sentimental ghost of a time just slipped past. This isn’t unexpected for a novel past its fiftieth birthday. Pat Frank (real name Harry Hart Frank) lived the latter part of his life in Tangerine, Florida. Fort Repose and environs are loosely modeled on this central part of the state. 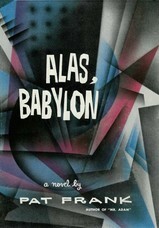 Frank wrote five other novels but none were as successful as Alas, Babylon. Hold Back the Night was made into a 1956 film of the same name. While now forgotten, the movie starred John Payne (Miracle on 34th Street) and was directed by Allan Dwan (Robin Hood, Heidi, Sands of Iwo Jima). Alas, Babylon’s post-apocalyptic peers remain more famous: On the Beach was made into a movie starring Gregory Peck and Ava Gardner, A Canticle for Leibowitz won the Hugo Award and is a science fiction classic, and I Am Legend has been made into three major Hollywood features. Over the past 50 years Alas, Babylon slipped through the cracks of popular culture, and undeservedly so. In its own way, it is as contemporary and interesting as On the Beach or I Am Legend and certainly worth a read. Frank Tota lives and writes in Miami and will soon do the same in Maine. “A Bestiary,” according to the website of the Aberdeen Bestiary, “is a collection of short descriptions about all sorts of animals, real and imaginary, birds and even rocks, accompanied by a moralising explanation. Although it deals with the natural world it was never meant to be a scientific text and should not be read as such. Some observations may be quite accurate but they are given the same weight as totally fabulous accounts.” In the Middle Ages, manuscripts like the Aberdeen Bestiary were often presentation volumes for noble patrons, copied on expensive vellum, lavishly bound, and illuminated with gold leaf and precious pigments. 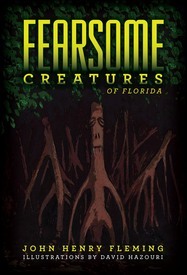 John Henry Fleming’s Fearsome Creatures of Florida doesn’t immediately look the part. No vellum, no bespoke binding, and the illustrations by David Hazouri are pen-and-ink drawings, not illuminations. Well, blame the price of gold leaf. It may not have the elaborate accoutrements, but make no mistake: Fearsome Florida Creatures is a bestiary in the fullest sense of the word. In these pages, Key Deer and Everglades-dwelling Burmese Pythons—real Florida fauna—rub haunches and scales with well-known folktale monsters like the Chupacabra and the Skunk Ape. Add some creatures surely dreamed up by Fleming himself, and the menagerie is complete. Fleming’s inventions take their shapes from Florida’s landscapes, both natural and man-made: The Okeechobee Flatwhale, shaped like a giant flounder, which surfaces from the shallows of Lake Okeechobee once a day to take a single, gale-force breath; Links Sprites, responsible for lost golf-balls and the untimely deaths of those who track their shots too far into the rough; the Were-Panther, native to the habitat around Alligator Alley, known to hurl itself through the windshields of speeding cars because it “may only reproduce itself by piercing the flesh of a human traveling at least 75 miles per hour, passing away even as it passes on its mutant genes.” Even those entries concerning animals the reader is more likely to have seen are filtered through his sense of place. I’m skeptical about the reports he cites of Key Deer blockading US1 and dooming anyone trying to flee at the last minute from hurricanes. But then, this book was never meant to be a scientific text, and shouldn’t be read as such. The moralizing tendency proper to a Bestiary is here too. Okeechobee Flatwhales give Fleming the opportunity to discuss water management in Central and South Florida; the entry on the Were-Panther meditates on the way the interstate system insulates travelers from the natural world they pass through. But it’s not just environmentalism that animates the author. His Chupacabra is the kind of illegal immigrant that might appear in a xenophobe’s nightmares, both an evocation of horrifying otherness and a call to reconsider our relationship with the other: “Hey, Chupacabra, you goat-sucking intruder, where did you come from? You dog-paddled across the Florida Straits. You stowed away in a freighter’s hold. You dug a hole under the fence and squeezed your ugly dog-snout through, giving the rest of us a bad name. And then, like us, you were free.” Fleming’s goal, as stated in his introduction, “is to make at least some readers — those not settled too comfortably into the lanai of their prefab paradise — turn their heads to the man-monster’s shadow next time, to suppress for a moment the instinct to deny. Entertain instead the possibility that what you see may be real after all.” He wants us to see Florida as the snarled, fraught place it is, not the endless vacation it’s made out to be. No doubt some readers will react to this moralizing with the same disappointment they felt when they realized C.S. Lewis had slipped a religious allegory in with the fantasy of the Narnia books (themselves repositories of some marvelous beasts). Take Fleming’s entry on the Hanging Trees, oaks that lure unwary Floridians into their clutches with shady bench swings, then choke them to death while whispering about lynchings and the KKK. It’s edifying to be reminded of the state’s history of racist terrorism, but the didactic note in “The Hanging Trees” is so insistent that the piece can’t really work as ghost story, horror, or anything but a lecture. It’s possible to be too on-the-nose with moral lessons, no matter how good those lessons are. That said, there’s plenty of good writing here, as when Fleming imagines a python’s life as a pet before it’s released into the wild: “For a time, the boy basks in the notoriety of his storybook pet. New friends line up out the door to watch the Saturday afternoon feedings, when a live rat tunnels head-first to its death.” That rat may be my favorite creepy-crawly of the whole book: at its best, Fearsome Creatures of Florida shows how similar gnawing out a home for oneself can be to being digested. For a further taste of Fleming’s book, visit www.fearsomecreatures.com. Readers can view the Aberdeen Bestiary and find out more about its history at http://www.abdn.ac.uk/bestiary/. Jamie May is a Contributing Editor for The Florida Book Review and the Reviews and Features Editor for Gulf Stream Magazine. Known habitats include the FIU Creative Writing Department, where he is a candidate for an MFA in Fiction.